Samana Bay is the heart of the Samana region in the far northeast of the Dominica Republic. Along its shores, you’ll find the famed Los Haitises National Park, protected tropical forest where you can explore caverns adorned with native Taino petroglyphs, spectacular tree covered islets, and idyllic mangrove lagoons. The bay itself is also a popular attraction for divers and snorkelers, and during the winter months it becomes a gathering point for migrating humpback whales, which come here from cooler climes to mate and birth their calves. During this time, whale watching tours practically guarantee sightings of these massive marine mammals as the jump and play at the water’s surface. Samana Bay is the largest bay in the Dominica Republic, with dozens of towns and villages lining its shores. 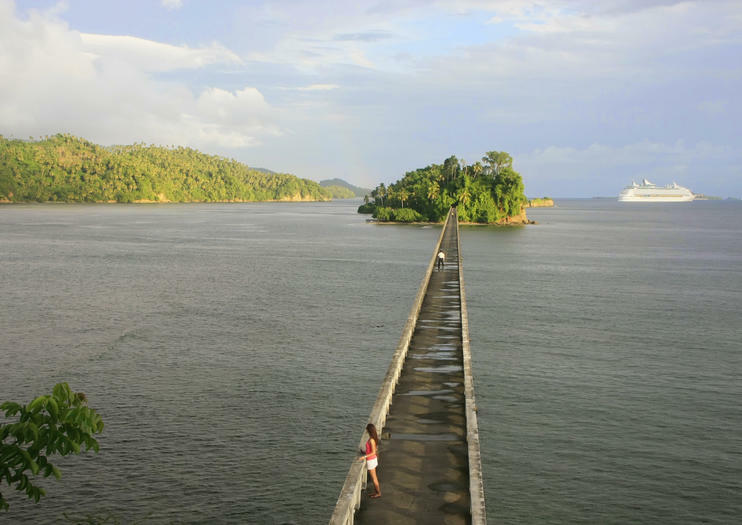 The city of Samana is the largest and most common jumping off point for adventures in and around the bay. Enjoy a relaxing day discovering the many wonders of the Samaná Peninsula from La Romana, Boca Chica or Juan Dolio. Travel via safari-style truck to Rancho Aventuras, where you'll embark on a horseback ride along jungle paths and across steep mountain passes toward towering El Limón Waterfall. Rejuvenate with a dip in its natural pool before continuing. Sip complimentary cocktails with lunch in the town of Santa Bárbara de Samaná and later wrap up your explorations on the stunning island of Cayo Levantado, where crystalline waters and white sands await. Discover all that Samana has to offer on this comprehensive day trip. The guided itinerary takes you from Parque La Ceiba to a Dominican ranch aboard a safari-style vehicle. Then head into the rain forest for a horseback ride and refresh in the pools of Cascada el Limón. After lunch, your adventure continues with a boat cruise to Cayo Levantado, where you can relax with a drink in hand. Go whale watching in Samaná Bay and visit Cayo Levantado during this full-day excursion from Punta Cana. Travel to Samaná aboard a comfortable, air-conditioned coach, then transfer to a boat at La Ceyba Park. Cruise out into the open waters to look for the pods of humpback whales who visit to breed and have their calves in the area. Learn about the behavior and biology of these marine mammals from your expert naturalist guide. Continue to Cayo Levantado, or Bacardi Island, for lunch on the beach and a dip in the azure waters before returning to Punta Cana. Cover more ground in less time with a Samana full-day trip that combines three excursions in one: a safari by open-air truck, horseback riding (bring cash for tips), and a catamaran cruise. An authentic Dominican lunch of fish, chicken, rice, beans, salad, fresh fruit, and desert will be served on board the boat. As a bonus, you’ll also visit Limon Waterfall, a secluded mountain waterfall that’s one of the Dominican Republic’s most sought-after waterfalls. Visit two top Dominican Republic natural attractions in one day on this guided tour of Los Haitises National Park Preserve and Cayo Levantado (also known as Bacardi Island). Begin your day by exploring pictograph-studded ancient caves, mangrove swamps, and tropical bird nesting sites before heading off in a small boat across Samana Bay. Enjoy a buffet lunch upon arrival in Cayo Levantado, and then spend the rest of the afternoon swimming through the blue waters and lounging on white sand beaches. Explore the Samana Bay and search for humpback whales with a marine biologist on this half-day boat tour. Learn about the biology and behavior of the humpback whales, who arrive in Samana Bay every winter to birth their calves. Enjoy the scenery of the surrounding mountains and Cayo Levantado along the way. Snacks, beverages, and round-trip transportation from Samana hotels included. Combine the best of local sightseeing with a whale watching adventure on this tour from Punta Cana. After a convenient hotel pickup from your area lodging, continue to the villages of La Colonia, El Cedro, and Muches before climbing aboard a covered speedboat for a whale watching excursion in Cayo Levantado or off Bacardi Island. This tour includes a guide, two meals, and round-trip transportation from your hotel. Get up close with the Dominican Republic’s gentle giants of the sea during this 12-hour Humpback whale-watching excursion on Sámana Bay. Spend an unforgettable day observing the thousands of whales that flock to the island each year to mate, feed and play in its warm tropical waters. As you observe these beautiful creatures you’ll enjoy unique insights from your expert whale-watching guide. Finish the day with an included lunch and beach time on beautiful Cayo Levantado Island. Round-trip hotel transport is also included. Fly to Samaná from Punta Cana to observe the migration of humpback whales off the coast during this 12-hour eco-adventure. After touching down at the airport in Samanà, meet your local guide and transfer to a boat bound for Cayo Levantado. Arrive at the island oasis, a perfect speck of white sand fringed by palm trees, to enjoy the sun and sand. Dig in to a buffet-style lunch beachside. Board the whale-watching boats and spend the afternoon viewing as many as 1,500 of these spectacular marine mammals in their native habitat, many with newborn calves. This is the whale watching tour in Catamaran with out a big group of people. Also you can set the food in the Bacardi island. Embark on a whale-watching tour with a whale biologist at the helm, giving you the best chance of spotting migrating humpbacks. You’ll learn about the whales’ biology and behavior through guided commentary while watching them breach and tail slap around you. Stop at the idyllic Cayo Levantado for some time to lounge on the beach under the swaying palm trees and enjoy an included lunch. This 6-hour tour allows you to go horseback riding and get to know Playa Limon's rugged landscape. Departing from Punta Cana and including round-trip hotel transportation, you'll also get to visit tiny villages and sample some local delicacies. Book this trip in Catamaran. Others tours usually are in Gasoils boats and you get sicksea. We offer open catamaran and easier way to see the whales. Kim Beddall is the foremost Whale Biologist in the Dom Rep. Each winter the humpback whales make the journey from the North Atlantic to the Samana Bay to give birth to their calves and no one is better at explaining it all than Kim Beddall. The Canadian pioneer of whale tours in Samana! Enjoy the spectacular views of the mountains that surround the Samana Bay. Spend part of the day on the famous crystal blue waters of Cayo Levantado island (sometimes called Bacardi Island). You’re safely attached with climbing gear to the cables by our professional and friendly guides who explain all you need to know to have the time of your life on our 10 zip lines, the longest one being 450 meters long!• An adventure that will have you flying over the copious mountains in Juana Vicente. Experience a maelstrom of emotions as you glide over breathtaking landscapes in the small island of Cayo Levantado.• Descend throughout 20 platforms and 10 zip lines. Scour fun and challenging distances, reaching between 85 and 450 meters. We leave the hotel to reach Rincon Bay, voted among the 10 most beautiful in the world. We visited the higuanario to see the higuanas and to know its way of life, reproduction and surroundings.We stop at a typical house, demonstrating plantations, drinking coffee, chocolate and tasting tropical fruits. Then visit the school to explain briefly about the educational system of our country.We continue the journey towards the Beach, to relax and enjoy until noon, where we will have a tasty lunch of lobster, fish or chicken. After the rich lunch, take advantage of the warm waters of the Caribbean Sea and relax on the virgin beach of Rincon.A visit to the brackish cold crystal clear water river across the Bay and conclude this beautiful day in paradise. This is the Normal Tour for whale watching with the visit to the Bacardi island. Food is not incluide but you can book your own food on the island. See the humpback Whales of Samana + the majestic 100 foot tall El Limon Waterfalls! Truly an experience of a lifetime.